A rather long and well-attended meeting of the Boca Grande Historic Preservation Board on Wednesday, April 10 yielded some interesting conversation regarding rumors and speculation surrounding a home at the corner of E. Railroad Avenue and 11th Street. It wasn’t even an item on the official agenda, but it was the topic of conversation that at least 30 people turned out to hear. For the last two months at Historic Preservation meetings, a construction project at 1050 E. Railroad Ave. has been a point of curiosity, as there was an attempt to make the home into an assisted living facility in 2017. With the current construction project underway and no construction plan box in sight, people wondered what was happening there. Many people are concerned that a facility that will house multiple physically and mentally disabled people will open within the walls of the property, and they are confused as to why this project did not go in front of the Historic Preservation Board. The property is owned by the Sodel family of Boca Grande, but it is listed under the ownership of Seas the Day BG, LLC, ℅ Fergeson Skipper PA out of Sarasota. In anticipation of discussion of this home at the meeting, Certified Professional Planner and Project Manager Anthony Rodriguez brought Lee County Attorney Amanda Swindle. When public comment at the end of the list of scheduled agenda items began, so did the conversation about the assisted living facility. Rodriguez began by explaining what permits had been pulled at the residence. There were to be changes to the exterior of the home, including the rearranging of some windows and doors, the addition of a handicapped-accessible ramp on the northeast part of the home, and a generator-elevating structure to be built. There would also be security gates installed on the driveway and the west side of the property, and the swimming pool that is there now would be filled in as a patio area. The interior, which is currently gutted, will include a new bedroom/bathroom and kitchen plan, a common living area, a kitchen/breakfast area, an exercise room and a laundry room. Rodriguez said he went through what was approved in the interior plans, and exterior elevations and changes were requested by the applicant to be expedited, as a severely handicapped person needs to utilize this property as soon as possible. He then reiterated that the project was filed under single-family residence, and in order for it to become an assisted living facility, the owner would have to deal with “shelter-in-place” issues, among others. He also reminded the board that a new Certificate of Appropriateness would need to be issued if that was the case. Board Member Becky Paterson said she didn’t see where these proposed changes fell into the ADA category. Rodriguez said these changes were made for security purposes, including the changes to the sizes of windows and doors that were made to remove security concerns. Jerry Edgerton, a new board member, said he has been to the site, and it seems as though the changes are excessive. He said that while this started as an interior remodel, when you look at what has been done it appears there has been an excessive amount of exterior work done that the board should have been made aware of. The audience responded with applause to this comment. Swindle then addressed the board, saying that once her department received a request from the applicant’s counsel requesting the project be looked at under the ADA regulation, her office conducted extensive research. Paterson asked why no architectural review was done on this noncontributing home in the Historic District, and why the Board had no chance to review the changes. “A review for ADA compliance is not in the purview of this Board,” Swindle said. “You are given very detailed standards as to what you are reviewing. None of those have anything to do with the ADA. When asked by someone in the audience if a past threat to sue had anything to do with Swindle’s statement, she admitted it did. Further discussion continued regarding the “what if” potential of the situation, and numerous Boca Grande residents stood to speak out against the potential issue (including attorneys hired by residents and the Gasparilla Island Conservation and Improvement Association). In the end the Board voted to ask for a “stop work” order for the project. A second motion was also offered, which would allow them to review any building permit that comes up within the Historic District. Third, the Board asked for the County to come back to them at next month’s meeting with an attorney to represent them … one, they said, that hadn’t been threatened with a lawsuit. In other business, a Certificate of Appropriateness was just narrowly voted in at 235 Whiskey Row, the Mazza property. The homeowner and her contractor, Justin Sexton, were present to explain why they wanted sliding doors instead of the strongly-suggested French doors on the Gulf side of their property. After a long conversation, the Board passed the proposal 4-3 to allow the homeowner to do what they wanted. Lastly, the contractor for a project at the McLaughlin house, 470 Tarpon Street, asked for permission to change the exterior chimney stone facade to “tabby shell stucco,” and to alter window and door styles on the east, north and south elevations. The contractor also proposed a louvred cover surrounding the air conditioning equipment on the roof of the home. 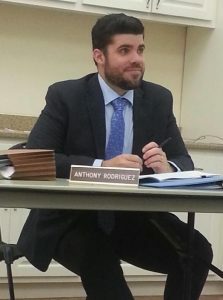 When it was pointed out that changes to the door styles had already been done without the permission of the Board, Rodriguez said he realized that was the case, and that the homeowner and contractor were looking for permission after the fact. “This is not a typical situation, this is an exceptional case, and I understand your concern,” he said. The next meeting is scheduled for Wednesday, May 8.